Started uni since 1998? You may have paid off your loan when you shouldn't and be entitled to cash back. £300 is a typical reclaim, £1,100 the biggest we've seen. You could be owed money from the Student Loan Company if you started paying too early. Our Freedom of Information request found that in three years alone, over 100,000 university leavers repaid too soon. Yet as this could go all the way back to 1998, it's likely there are 100,000s more. See our full Student Loan Overpayments guide. As Mekila emailed: "I got £1,100 for early repayments before April 2009. It took literally five minutes. What a bonus - I can't believe it." Had a loan, credit card, mortgage, overdraft or car finance in the last 30 years? You've less than a year left to check for PPI. Typical payout £3,000, our biggest-ever reported payout £153,000. Payment Protection Insurance (PPI) was systemically mis-sold alongside most debt products - sales staff were scripted to lie. So even though £30bn has been paid out, there's still billions more owed. The banks successfully lobbied for a deadline, and it's now less than a year away. 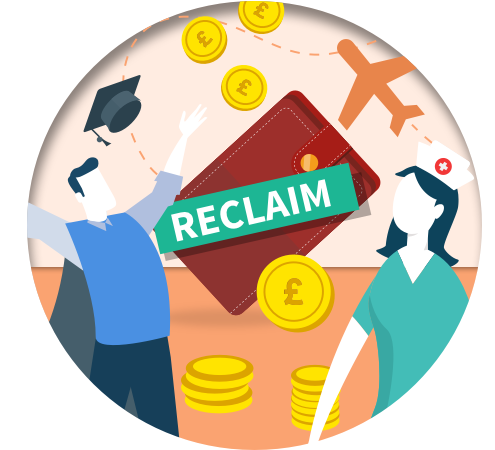 Join over 7m people who've used our Free PPI Reclaim Tool and guide to find out if you're owed - and get your money back for free. KH emailed: "We believed we never had PPI until we saw you tell everyone to check, even if you didn't think you had it. We had three policies over the past 20yrs and got almost £5,000 back. Thank you." Flight cancelled or delayed by at least three hours any time since 2012? You may be entitled to compensation. Up to £530 per person. You can claim for EU-regulated flights if certain conditions are met - eg, it must be the airline's fault. Use our free Flight Delay Reclaim Tool which helps draft your claim and escalate it too if needed. Nic emailed about claiming for his family: "Using Resolver we were told within 24 hours of submitting the claim we were due £1,406. Used it towards a holiday to Gran Canaria." Wear a uniform to work? You're entitled to claim tax back. Typically £60-£185, biggest we've seen £250. If you wear a branded T-shirt, overalls or other uniform for work, wash it yourself and don't wear it elsewhere, you're entitled to a tax rebate each year. Many haven't claimed it, so can get a backdated payout going back up to four years. See Uniform Tax Refund. Pete tweeted: "Used your uniform tax refund notes and received a letter saying they're refunding me £180 for the last 2 years. #Happy." Stung by bank charges? You can still claim if you're in financial hardship. Typically £100s, but can add up to £1,000s. While it's harder now than it used to be, reclaiming bank charges can still be done, but you need to be in genuine hardship to claim. We've free downloadable template letters to help in Bank Charge Reclaiming. Claire emailed: "I'll get six years of charges back and a goodwill £70 on top... total £865. Thanks Martin." Paying a sky-high energy direct debit? Challenge it and you could get a refund. Typically £100s, but can be £1,000+. Paying by monthly direct debit cuts energy costs by roughly 7%. Yet some providers massively overestimate how much energy you'll use over a year, so your monthly payments are too high. It usually just involves a quick call to lower them and get overpaid cash back. Plus old providers may owe you too. See How to Reclaim Energy Credit. The impact can be huge, as Chris tweeted: "I updated my meter reading and discovered I was over £1,300 in credit. Not only do I have a nice refund before Christmas but a better monthly direct debit too." Baffled by a mysterious £79 payment to Amazon? Reclaim unwanted Amazon Prime. Usually £79 - can be more if you've paid out for longer. Amazon Prime gives users one-day delivery and access to services such as video streaming. Yet many have been charged for unwanted Prime membership - some who didn't even realise they'd joined in the first place. We've full help to cancel in Amazon Prime Refunds. Forumite Gassey says: "I contacted Amazon, pushed them a little and got two years' Prime fees back, £158. Not bad for a five-minute phone call." Ever paid a fee each month for your bank account? Check if you were mis-sold. Payouts range from £100s to £1,000s. If you've got or had a packaged bank account - where you pay a monthly fee for extras incl travel, mobile or breakdown cover - you may be owed cash. Many get these accounts for cheap insurance. Yet they've also been mis-sold on a massive scale. To help, we've a Packaged Bank Account Reclaim tool that we built with complaints specialist Resolver - it helps draft your claim, keeps track of it and escalates it if needed. Alice emailed: "I used Resolver to reclaim packaged account fees from 1995 to 2018 and got a whopping £3,902." Are you in the wrong council tax band? Check and challenge it. Typically £100s, biggest we've seen £13,000. Up to 400,000 homes may be in the wrong council tax band because the original valuations were slapdash. It takes ten minutes to check. If you are, not only can you get what you pay reduced, you can get a backdated payout from when you moved in. Don't just challenge willy-nilly though, or you could find your band hiked. Our Council Tax Bands guide has the full system. 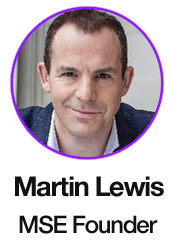 Sue emailed: "Thanks so much to Martin Lewis - because of seeing him on a TV programme I got in touch with my local council and received over £3,500 back." Use a London Oyster card or contactless to travel in the capital? You could be due a share of millions. A tenner's typical, but we've heard of a £72 success. If you failed to touch your card out at the end of a journey, you'll have been charged the maximum fare - but you can claim the difference back. Plus if you've an old Oyster, you can claim a share of £332m in old unused credit and deposits sloshing about. All it involves is a few clicks - our TFL Refunds guide shows how. Forumite Daaave says: "I ended up with 4-5 Oyster cards kicking about my house. Got £27 credit back. Took about 10 mins." - Find the card most likely to accept you BEFORE you apply. Each card has a link to our balance transfer eligibility calc. It shows how likely you are to be accepted, so you can cut your risk of rejection without impacting your creditworthiness. - Go for the lowest fee in the time you're sure you can repay. Most cards charge a one-off fee on the amount transferred - try to minimise this (factor in cashback). If you're not sure how long you need, play safe and go LONG. - 'Up to' cards mean you could get a shorter 0% deal if accepted. That's why we include the best 'non up to' options too. (1) You must shift debt within 60 days to get cashback. (2) % of debt shifted. (3) You pay a higher fee upfront & it's refunded to the level shown. Balance Transfer Golden Rules. Full info and ALL best buys: Best Balance Transfers (APR Examples). b) Clear the card or balance transfer again before the 0% ends, or the rate rockets to the higher APR. c) Don't spend/withdraw cash on these. It usually isn't at the cheap rate. d) You must usually do the balance transfer within 60 days to get the 0% and/or cashback. 1.5% easy access savings, best rate since Jan 2016. Mega-popular last week, so for those who missed it... get 1.5% AER variable (incl a fixed bonus of 0.15% for 1yr) from Marcus Bank*, the UK arm of investment banking giant Goldman Sachs. See Top Savings for more. Ends Sun. Free Halfords MOT with 50p spend - book any time until Oct 2019. How to get a 'free' MOT. 'Free' Amazon £6 credit for some. See if you're eligible for 'free' £6 Amazon credit. Missed out on Glastonbury tickets? How you can still go for FREE. On Sun it sold out in 30mins... but we've five ways to get to Glasto for free. Free and cheap flu jabs. Winter is coming... find the cheapest lurgy protection. Let me be blunt. It's too late to bag this winter's cheapest energy deals. We've constantly nagged about cheap switcher tariffs being pulled, mostly on the back of big oil price rises. In early Sep, someone with typical use could lock in a cheap fix for £867/yr, now it's £1,005/yr - an unprecedented 16% monthly rise. I don't want to say I told you so, but if it's an excuse to again nag about the importance of sorting this, I'll do it... I told you so. Yet while you can't now save as much, for most who are on Big 6 standard tariffs a £220/yr saving with a promise of no more price hikes is possible, so sort it NOW. It ONLY takes 5mins to find your cheapest... (imagine I offered you £200 for 5mins' work). It amazes me so few do this, when it's an incredibly lucrative use of time. As your cheapest depends on where you live and your usage, use a comparison site to calculate it. Yet beware they no longer need show you all tariffs, so many now only show those that pay 'em. Of course, our Cheap Energy Club comparison is whole of market by default. - The 'I only want firms with great service' comparison - based on our twice-yearly polls. - The 'No price hikes' comparison - this only lists fixed-rate tariffs (or go long with a 2+ winters fix comparison). - The 'I only want names I know' comparison - only shows Big 6 and big brand firms. - The 'I like my current provider, find me its cheapest' comparison - so you can save without switching. - The 'Green me up, I want renewable energy' comparison - lists only those with 100% renewable electricity. Isn't this all redundant as Ofgem's launching a price cap in December? No. Those on providers' standard deals will see prices capped from Dec. For someone on typical use, that means Big 6 prices will drop from around £1,220 to £1,136 a year (for clarity, this doesn't mean £1,136 is the most anyone pays - use more and your cap's higher). Ofgem calls this a 'fair' tariff but that doesn't make it a 'good' tariff - the cheapest deals are still far less. And be aware this cap is to be updated every 1 Apr and 1 Oct. Since it first announced the cap, wholesale rates (what energy firms pay) have exploded, so some predict it could be £100 higher on 1 Apr. Is there a chance prices could fall - is it safe to lock in now? There's no sign recent world energy price rises will reverse (but that doesn't mean they can't). And prices could still rise further. Locking in on a cheap fix now protects you from that. If things reversed very heavily you'd usually pay £60ish early exit fees - yet if you're overpaying now, the small risk of that's trivial compared to what you'll save. Ends Thu. Fast fibre & line equiv £21.39/mth - less than many pay for normal fibre. Newbies to TalkTalk can get superfast avg 63Mb speeds on an 18mth contract. You may need to trade top service for the cheap price though - our last poll saw a small improvement, but still 38% rate it 'poor'. Pay £25/mth on an 18mth contract but claim & spend a £65 Amazon, Argos, Tesco or Ticketmaster vch to make it equiv £21.39/mth. See Broadband Unbundled for more options. Large A2ish photo canvas for £14.49 delivered (norm £58). MSE Blagged. Or bigger size for £20. Ends Sun. FREE MSE Mental Health & Debt 2018 booklet. It's Mental Health Day today (Wed). Sadly those with mental health issues are 4x more likely to be in debt crisis. If you or someone you know is impacted, download our free 44-page Mental Health & Debt 2018 booklet - and Martin's Money & Mental Health Policy Institute charity would love you to join its Experts by Experience group. Split your ticket to save. We always say chuck the logic book out the window with trains, and this is particularly true when it comes to split-ticketing. Same train, same time - buy two or more tickets and you may save large. Eg, we found a Manchester to Edinburgh ticket for £106, but Manchester to York then York to Edinburgh was £60. See how to do this and tools to help find where it works in Split ticket help. Swap £10 Tesco vouchers for £30 train tickets. You can exchange Clubcard points to use on train site RedSpottedHanky. It works on advance tickets and with railcards, but note there's a £1 booking fee (and Tesco's stopping this offer in Feb). Slash the cost with a railcard - some can get one for £10. Railcards - for families, couples, under-26s, over-60s, disabled people and more - give a 1/3 off many fares. 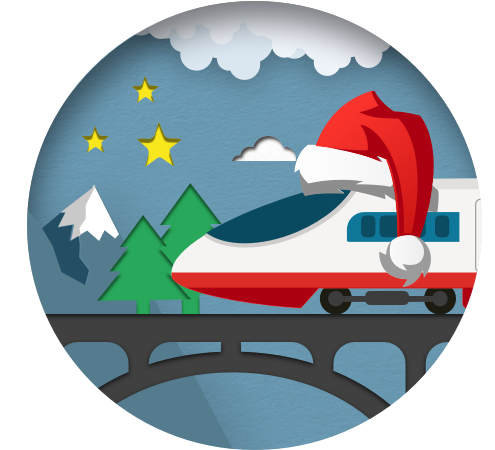 To max the saving, look for a deal on the railcard itself - right now we've blagged 15% off a 16-25 Railcard, and if you or a pal has a season ticket in the south of Eng or West Mids, you can bag a £10 railcard. Full info in Railcard savings. "Thanks. I just haggled down my BT bill from £74 to £48 with one phone call. Over the 18-month contract this will save me £468." Would you eat food past its 'best-before' date? This week, Tesco announced it is removing 'best-before' dates from over 100 fruit and vegetable products in an effort to reduce waste. So when you find food at home past its best-before date, what do you do? Would you eat food past its 'best-before' date? Older MoneySavers are most likely to pick up a penny. In last week's poll, we asked if you'd bend down to pick up money lying around and 14,000+ of you responded. Tellingly, the most likely group to pick up coppers were the over-50s, with 71% saying they'd pick up a penny. In contrast, less than a third of under-25s would do the same, in fact, 12% of this group wouldn't pick up less than £1. See full penny poll results. - Old-Style board thread of the week: What sort of stuff can I pickle? - Discussion of the week: Stay with your parents, or rent? MSE Steve B's A: Annoyingly the regulator Ofcom's rules do allow telecoms firms to raise prices mid-contract - in Virgin's case, it's said it's to cover rising costs. However, the rules also say you can leave your contract penalty-free if prices rise, so long as you tell your provider you're off within 30 days of being notified. This means you are free to switch to another provider - see our Broadband Unbundled tool for the best deals - or if you'd prefer to stick with Virgin, it's also the perfect time to haggle. 82% of MoneySavers who tried were successful in negotiating a better deal with Virgin, such as Mary: "Phoned when threatened with yet another price hike. Now paying £25 per month instead of nearly £50!" See our Haggle with Virgin guide for more tips. That's all for this week, but before we go... we've yet to get to Halloween but (scarily) the door is already open to novelty Advent calendars. One of the earliest to pop up at MSE Towers is the Pringles Christmas calendar, featuring 12 cans of crisps hidden away behind the festive windows. But is it actually a deal worth singing Pringle-bells about? Head over to our Advent calendar deals page to see if it stacks up.